The SAR Body Splint provides excellent, clinical immobility, during rescue and extrication, offering great protection to the casualty, yet light enough to make little difference to the patient weight and compact enough to ease egress from confined spaces. Its transit to the rescue site deploys only one man, who will be well able to carry other kit, as well - even whilst wearing a BA set! Thus as few as two rescuers may readily deploy the kit and safely evacuate a casualty, in the shortest possible time. The most difficult aspect for using the SAR-evac is the use of the head-strap, used to immobilise the casualty's head and limit neck movement (this does not replace a cervical collar) and where we found a bit of practise essential. Otherwise, we rated it faster, lighter and more reliable than Jordan lifting frame, faster than the Neil Robertson design (which we still like - despite its age) and as useful in preventing extrication injuries as most basket and sked stretchers - albeit, it does not replace these for open, mountain and cliff rescue. The people who run SAR Products have lots of relevant experience and we cannot fault their own description of the stretcher. We have had this product available to hire, for some time and our experience of its site performance - in utility works, Gas and Oil drilling and Power Stations - has been that it is very robust, easily cleaned and disinfected and good value for money - on top, of course, of a very creditable performance, compared with most competing stretchers. Here's what SAR Products says about it: SAR Products has once again improved the EVAC Body Splint. The thickness of the lower outer skin has been increased to give more resistance to abrasion, whilst using a new lightweight material on the upper skin in order to maintain the overall weight of the item. We have also changed the head strap to give two fitting systems so as to give a firmer head restraint. The SAREVAC has a width of 68cm across both the shoulder and hip areas and is 205 cm long, giving more security and protection to the casualty.. It has six horizontal lifting loops three down each side positioned along the main trunk/torso of the casualty. All the main casualty securing cross straps are of 50mm webbing with adjustable two piece clip buckles. It has an integral body harness made from 25mm web with crutch padding and adjustable foot support with padding for extra security and to stop body slip when in a vertical or angular mode of lift. The two main vertical lifting loops are positioned at the shoulder this gives a true vertical lifting position for the casualty. The head section can be formed into a cone to disperse debris when dragging through confined spaces. The strap holding the stretcher in its rolled position has a fitted pad and can be used for a head restraint by threading it around the outer loops on the coned area. It can also be used as a lifting mat without the use of the straps, two people can transfer a casualty from one flat area to another keeping the casualty in a horizontal mode. The lower outer material is ORANGE and made from FLAME RETARDENT, heavy duty PVC reinforced nylon. The Inner and bag are made from standard PVC reinforced nylon. •Packed size inc. bag: 75 x 30cm. 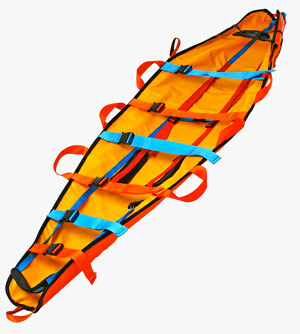 Click the button below to add the SAR-EVAC body rescue splint with strap kit to your wish list.